Jumbo currently my only vehicle and used as a daily driver. The name Jumbo comes from a friend of mine who likes to name vehicles after their licence plate letters (JMB). 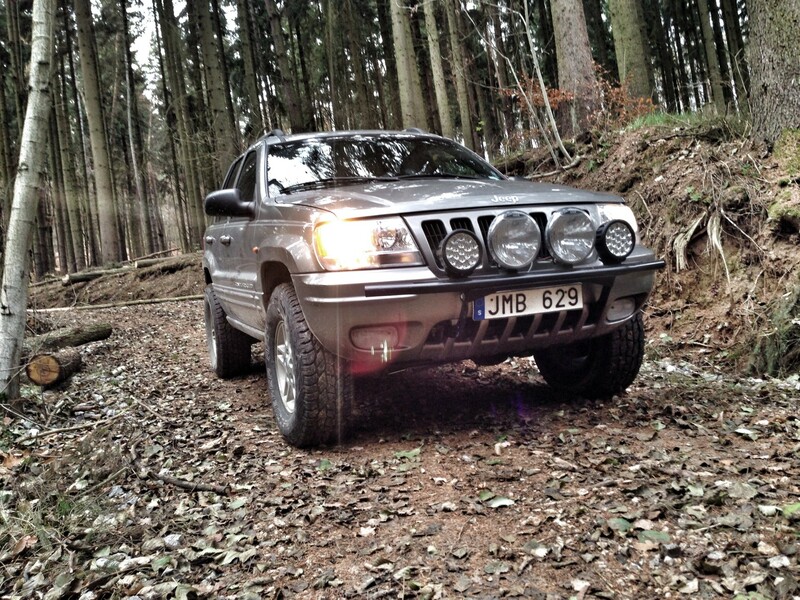 Jumbo is a Jeep Grand Cherokee from 1999 with the 4.7L v8 and is manufactured in Austria. 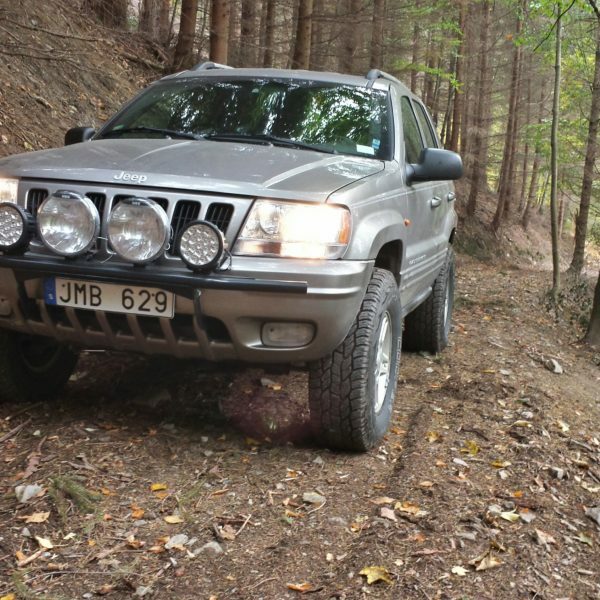 The fact that the Jeep Grand Cherokee made in Austria makes it a WG and not a WJ, the difference between them are minimal. 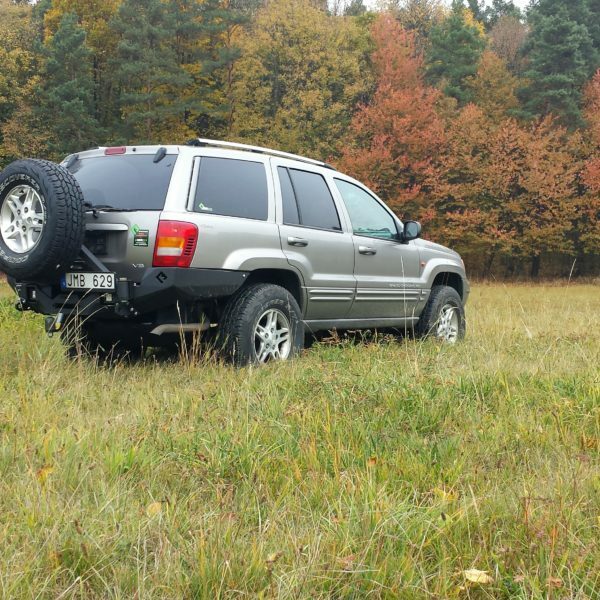 The Jeep Grand Cherokee 1999-2004 is very underestimated as a overlanding vehicle, it has a powerful engine with a ok reliability. Solid axles front and rear (D30, D44a), good transfer-case. It has the off road capability of a Wrangler with the power of a muscular and the comfort of a couch. The only downside is the insane fuel consumption. 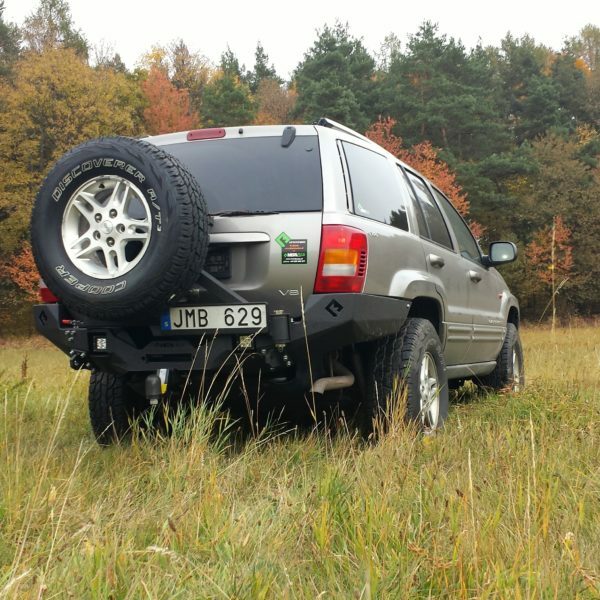 Jumbo has 2″ lift springs and shocks from BDS, the springs are really hard compared to the stock but i can really recommend them to anyone that wants to get a slight lift and still want to have acceptable road handling. The BDS shocks is not really living up to the performance of the springs, they are normal hydro shocks and not really a step up from the stock shocks. 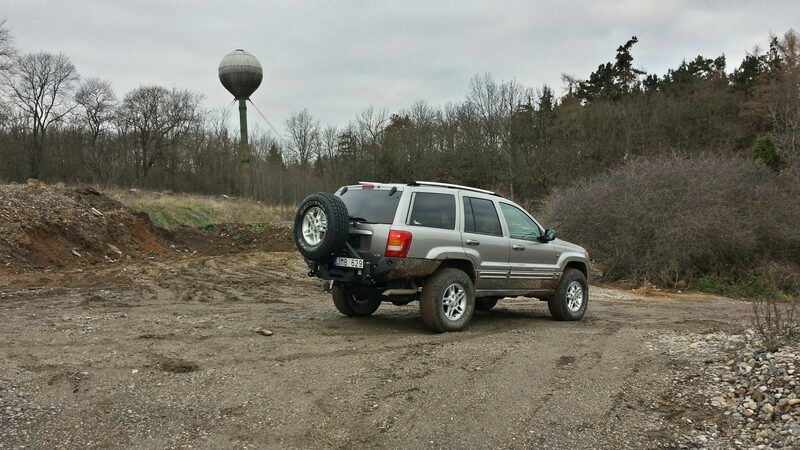 There is a problem that’s common for the BDS Jeep WJ 2″ lift, and that is that if you have the 4.7L v8 you will not get the full 2″ lift in the front. To compensate for that I installed Rough Country 0.75″ trim spacer in the front and a 10mm Old Man Emu spacer in the rear. 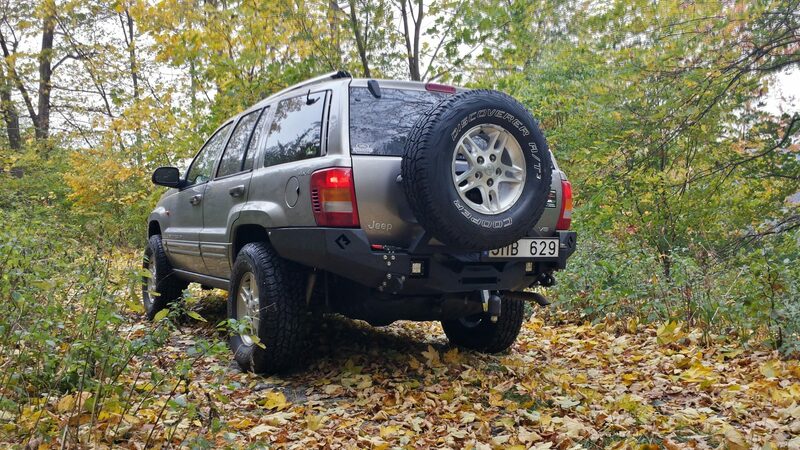 The bump stops in the front are extended 2.5″ with Iron Rock Offroad aluminium spacers and the rear are extended 2″ with a custom bumpstop. In the front Jumbo runs upper and lower adjustable Iron Rock Offroad heavy duty short arms. 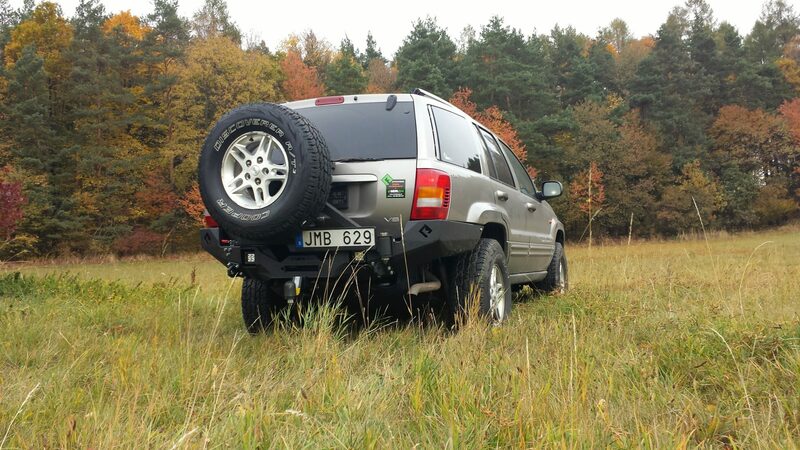 The wheels are stock 16″ Jeep Silverblades with a 5×5 bolt pattern, inside of them there are SpiderTrax 1.25″ hub centric wheel spacers to avoid any rubbing in metal parts. 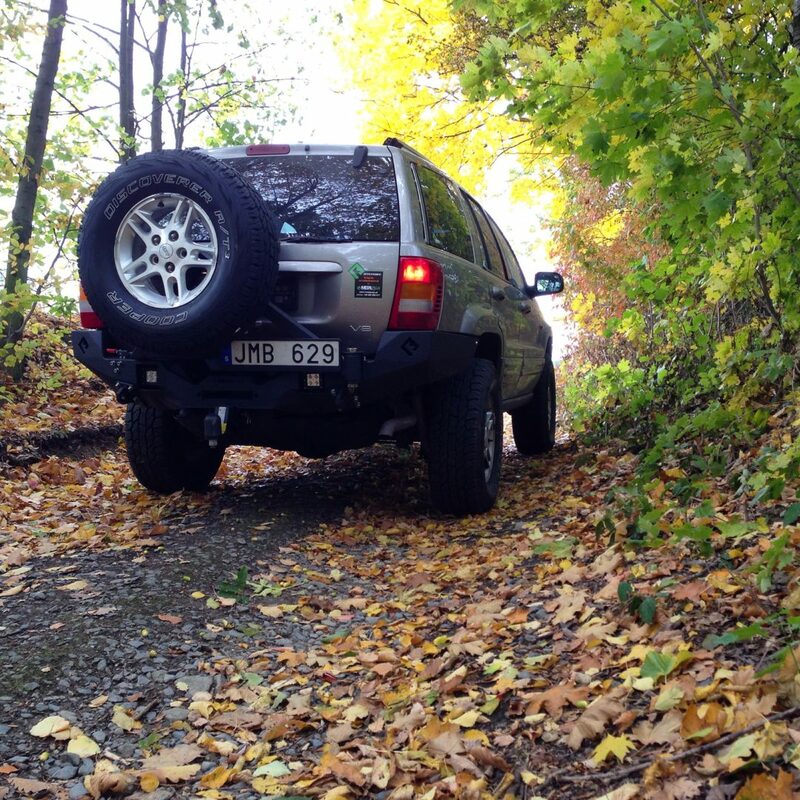 Tires are Cooper Discoverer AT3 265/75 R16 (32″ tall), a fantastic all around tire. They are quiet on the high way and perform exceptionally in off the road. 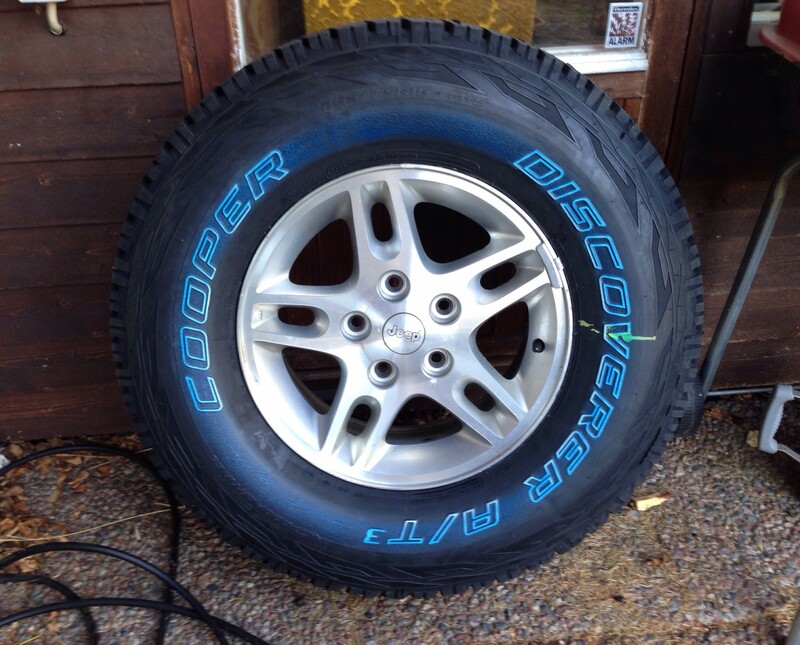 Cooper Discoverer A/T3 on stock Jeep wheels. 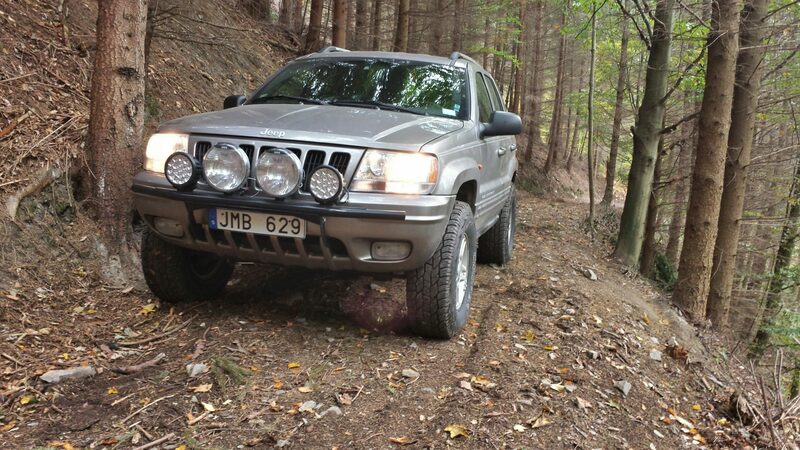 In the front i have a 4x4Fabworks light-bar/bull-bar and some trimming on the front bumper. 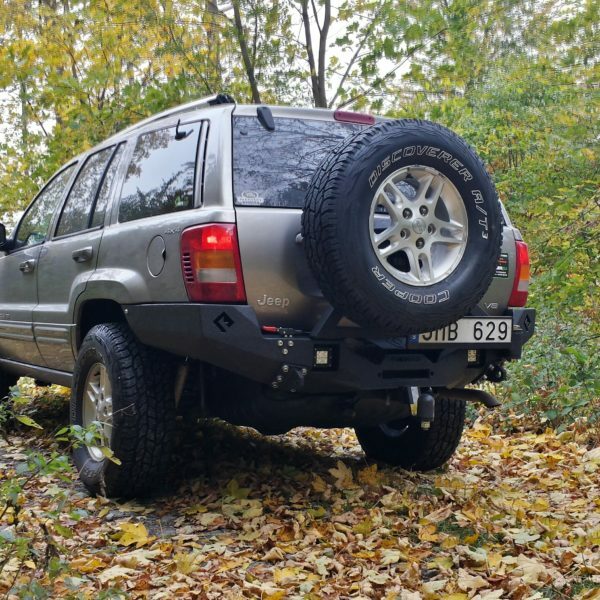 On the rear of the Jeep i have a Metalpasja rear bumper with a swing out tire carrier, winch mount (no winch yet), 2×2″ receiver, led pods and recovery points. The entire bumper is coated with Line-x paint. The stock front light housings has been changed for a pair of OEM replacements from EagleEye. 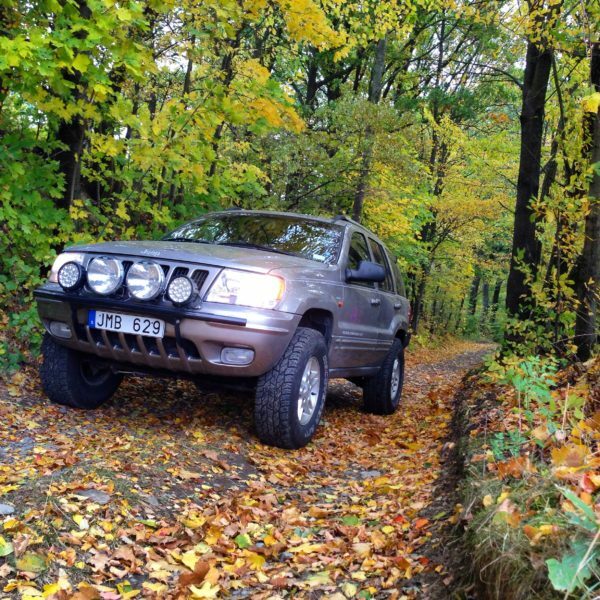 On the front i run two NBB Alpha with 75w xenon each and two 90W Led driving lights with a flood filter. In the rear i run two LED pods. To control everything i have a custom electrical system with slim switches in the cabin. 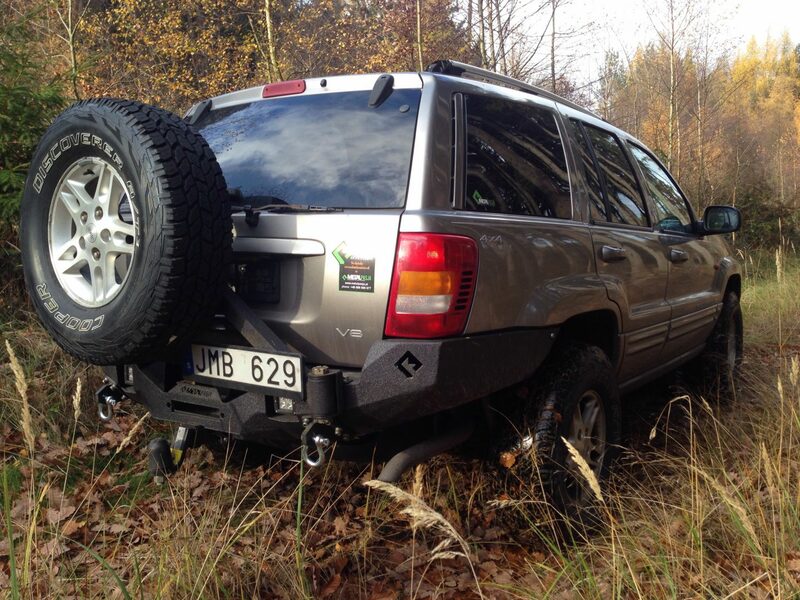 The steering is stock except for a Rough Country steering stabiliser. In the front Jumbo is equipped with a Carolina Driveline double cardon drive shaft (“CV”). It’s a replacement for the stock rzeppa-rzeppa drive shaft. Everything else is stock in the driveline.